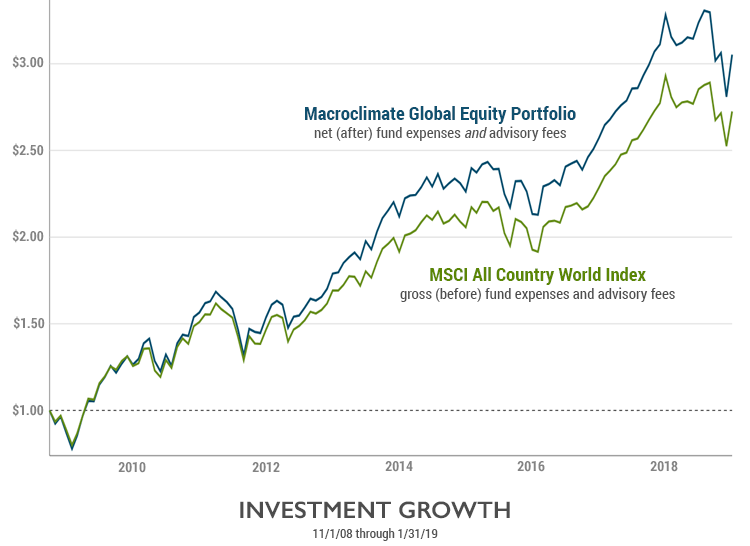 Macroclimate Global Equity Portfolio (blue line) is a composite of three funds: DFA US Sustainability Core Equity 1 Portfolio, DFA International Sustainability Core Equity 1 Portfolio, and DFA Emerging Markets Core Equity Portfolio (Sustainability beginning March 2018). Performance data shown represents past performance from November 2008 through November 2017 with monthly rebalancing. DFA US Sustainability Core Equity 1 Portfolio and DFA International Sustainability Core Equity 1 Portfolio were enhanced in March 2016 to exclude or underweight carbon-intensive companies. DFA Emerging Markets Sustainability Core Equity 1 was similarly enhanced in Mach 2018. Returns are gross total returns net of all fund expenses and Macroclimate® investment advisory fees for a “Starter” account (1% of assets under management, the highest fee charged for any account). Past performance is no guarantee of future results and current performance may be higher or lower than the performance shown. Comparative MSCI All Country World Index (red line) also is gross total returns, but is unmanaged and does not reflect the payment of advisory fees and other expenses associated with an investment in a fund. Investors cannot invest directly in an index. The comparison of the model performance to a single market index is imperfect. Due to the differences between the model portfolio’s investment strategy and the methodology used to compute most indices, we caution potential investors that no indices are directly comparable to the results of a model portfolio. Performance results are not based on a portfolio or accounts that were actually managed by Macroclimate®, do not represent actual trading, and may not reflect the impact that material economic and market factors might have had on Macroclimate’s decision-making if Macroclimate were actually managing clients’ money. Rather, they reflect the results achieved by means of the retroactive application of a model designed with the benefit of hindsight. The hypothetical back-tested model is composed of specific DFA funds Macroclimate currently recommends as part of its global equity strategy (as noted above), weighted by a proprietary investment allocation methodology. Furthermore, please note that: 1) the volatility of the MSCI ACWI index may be materially different from that of the model portfolio; 2) Macroclimate’s clients may have utilized different funds and may have had investment results that were materially different from those portrayed in the model; and 3) Macroclimate® began offering the Global Equity Portfolio after the performance period depicted above.